Rumor of the day: Sony and Marvel might get together on Spider-Man! (Yeah, wouldn’t that be awesome?) Get the details on Blastr. From JoBlo - on Ellen Degeneres' talk show, Robert Downey Jr. said that yes, an Iron Man 4 movie is coming. Before that, we’ll see Iron Man in Avengers: Age of Ultron on May 2, 2015. Adi Shankar, producer of the first Dredd film, has secretly been filming his own seven-part Dredd miniseries focused on the Dark Judges arc. That’s right — Shankar has created his own, unofficial Dredd project that’ll be released for free online later this month. And if you haven’t been watching, SyFy’s Face Off is halfway through the new season, and there have been some amazing makeups and creatures so far. 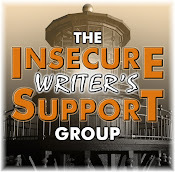 Industry expert and author, Anne R. Allen, is our guest at the IWSG Site today! 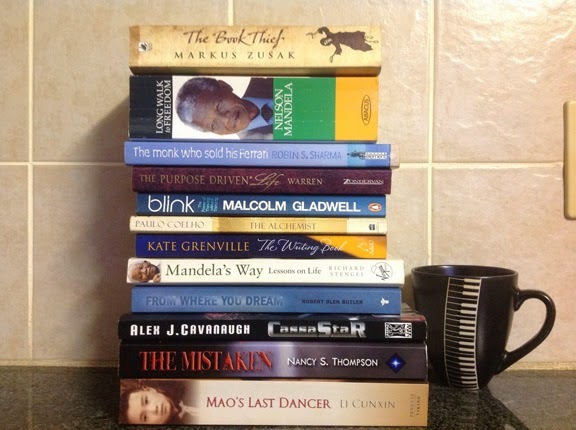 Thanks to Michelle for including my book in her Shelfie! Album title is listed – name the band. All in the category of hard rock and prog rock. Many of you asked about the song that inspired my latest manuscript. When and if I know it’s a done deal with my publisher, I’ll post the video for you. The song title is similar to the manuscript title, plus the lyrics give away some of the story, so you’ll have to wait a bit. The Flash was really good last night. Had an excellent DC comics vibe to it. Really random - peanut butter is awesome. I won't eat pancakes without peanut butter on them. Think Sony and Marvel might get it together? Have you been watching Face Off? Excited about the new releases? Know any of the trivia? Think Mini-Alex should make more appearances…? Wow, sounds like some great movies are in the works, or will be. Love the mums! Congrats on all the great news and releases. My husband and son have watched Face Off a few times and liked it! Yes, those Goodreads starter questions aren't very interesting. Readers can come up with way-better ones! Hey, those are my books...and my piano mug! Yay! Congrats on all the new releases! Congrats to all new books out. Seems quite a good selection. Regarding the Trivial. I scored a fat zero.....now if you were to ask questions about Danny Boy I may get one or two correct. Mini Alex is cute, and mums are sure sign of Fall. I'm excited about the new Avengers release. Those kinds of movies are my fave. I know Metallica, Queensryche, Satriani, Rush, and Alice in Chains. I might know the others with a reminder/refresh. Interesting post! A new Spider man movie I might enjoy and Robert Downey Jr does play a good Iron Man. The Ninja likes Peanut Butter on his pancakes. Sorry, to that I would have to pass. I like mine with maple syrup. Ninja looks like he is having fun as a praying mantis looks on. I had a stick bug on my door for two days when I came home from work. It is often referred to as a ghost bug. That seems appropriate and I wonder why it came to call. I am not really much of a fan of Spiderman or Metallica (it's the only one I know). However, here in New Zealand, I am a mum (British for mom). And finally, to round off this scattered comment - I think I will have pancakes with peanut butter. Awesome movie news! And congrats to everyone who has a book coming out. Mini-Alex is rocking out with that praying mantis! Random wondering: do you like peanut butter on celery too? My husband does and that's really odd to me. I grew up in Canada and we put cheese on celery. I love how they entwine movies like Iron Man and Avengers. Without cheating, I only know Metallica, Alice in Chains, Rush & Pantera. Walk is one of my fav songs! Elizabeth, I hope so! Thanks again for the tip. Yvonne, I bet you would get all of them correct. Rosey, you rock! You are correct. Truedessa, good job. And you got Shadows Fall - awesome! I've only seen a stick but once. Weird looking creatures. Christine, I've seen it both ways, but I don't eat celery. What's the point? You sound like my son--PB on everything. Have you tried Peter Pan's Honey Roast? He eats it by the spoonful. Wow, am I top 20?! YAY! Hmm, right off the top of my head I recognize Anthrax, White Zombie, Metallica, Alice in Chains, Rush, Queensryche, Dream Theater, and Pantera. Missed a few that I'm sure will be obvious as soon as I see them. Heck yes on IM4, I am in for that... I think that Spiderman might be too far gone for it to wreck what Disney/Marvel has done. I might be wrong, please let me be wrong. That praying mantis just needs to practice a bit more. Then you'll have an awesome guitar duet! So many movies in the making recently. I didn't know they were coming out with The Flash. Was it a pretty quick movie? I had read that there wouldn't be any more individual Iron Man movies. Guess that was wrong. These are great movies in the works. Ought to be satisfaction to many. No trivia questions answered though but a pancake with honey is a favorite. Thanks for sharing Alex! Ha! Love the praying mantis! Iron Man 4 ... sweet! Love the mums. Mini-Alex looks snazzy in front of them. You completely stumped me with album titles. I'd have to look them all up! I wonder why I can memorize song lyrics, but not other stuff. Hmmm. Mini-Alex looks awesome and ewwwwww. BUG!!! If that photo doesn't make a lady smile, I don't know what would. Well, I have a few ideas, but we'll keep it clean around here, Alex. That's to say, bring back Mini-Alex time and again. Smiles. I'm glad The Flash was good. I recorded it and hope to watch it later this week. Brinda's book looks awesome. I love that mini-Alex hangs out with a praying mantis. Those insects are so cool. Peanut butter is yummy. And the only album I could name the band is the Metallica one. I LOVE that feature on Goodreads. Seriously. It doesn't get much better than being able to do a Q&A with the author. I like mini-Alex becoming at one with nature. Haha! Nicely posed praying mantis! I've heard conflicting reports about Iron Man 4. He did say on the Ellen show that there would be an Iron Man 4, but he told someone else that there wasn't anything in the works. Mini-Alex cracks me up. Pretty flowers! I find it interesting that many of these shelfies aren't on actual bookshelves. I wonder if a lot of people have the problem I do--most of my books are on my Kindle, so I don't really have a need for a bookshelf. I love the praying mantis on the guitar. It's such a touch of serendipity when things like that come together for a photo shoot. Love the picture with Mini-Alex. Peanut butter on pancakes? That is pretty random. I'll stick with syrup thank you. Never had the pancakes with peanut butter. Flash was also awesome, lots of Easter eggs. Always fun to see your own book in someone else's book pile! No, I have not heard of the fight between sony and Marvel. Not until now. I can't wait to see the next Avengers movie, same goes for Iron Man; I love them. Melanie, I'm a Jif man. Debra, at least he had a head to sing with. Loni, it's a weekly series - first one was last night. Sherry, I'm hoping there is one more. Stephanie, we still have bookshelves, but most of my books are on my iPad. I've been waiting for Sony and Marvel to get it together since they first acquired the Spider-Man rights. Let's hope it really happens. Yay for Iron Man 4! Glad IM4 is getting made, enjoyed 1 and 3, 2 sucked. Wonder if he'll get his wish and have Gibson direct or be in it haha glad the flash is good, gonna save a few episodes and then binge watch that. 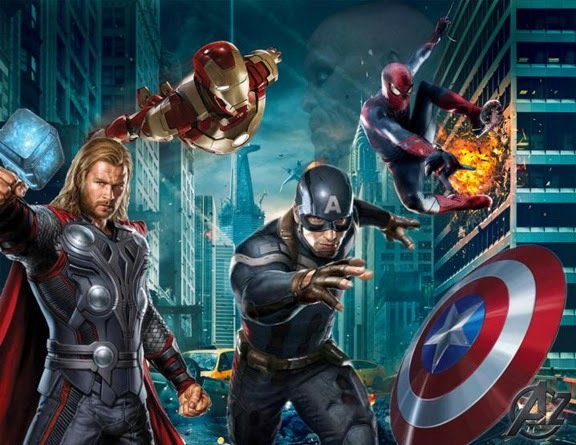 Spiderman in the avengers would be awesome, as long as they don't make him dark and dreary like the 2nd movie. Now if only Fox would stop being idiots and let Wolverine come out to play, be all set. I always love a mini-Alex appearance! And I'm with you on peanut butter. It's like the best thing on earth. YES to more mini alex! Ha, that's hysterical..and I am totally stumped on those album titles. And I so love peanut butter, but I never thought to put it on pancakes - yum! I could live on peanut butter but have never tried it on pancakes. Now I want to right away. Will check out your Goodreads Q&A- I didn't know that was a possibility there. Fun learning you love peanut butter. I really like it too but not sure about it and pancakes. Peanut butter is a great start, Alex. And what fun. Good on you. Pat, hope that wish doesn't come true. And so true about Wolverine. Brian, yes, and last night's episode was frustrating. Madeline and Julie, give it a try! How did I know you'd have a Rush and DT album on the list...? Sony and Marvel should get together. I'm eager to see Spiderman meet the Avengers. However, I think they should recast Spidey. Congrats to all the authors! I look forward to seeing your Q & A! Now I have a craving for peanut butter pretzels! The mums are pretty. Love to see them on doorsteps in the fall. Have you tried the almond butter? Definitely think that mini Alex should make more appearances. The mums look very nice. Sweet shot of Mini-Alex with the mums and praying mantis! Ivy, I tried for you. Larry, perfect score! And of course I would have both Rush and Dream Theater on the list. That's cool Shadows Fall records at your friends' studio. Birgit, I taped it and will watch tonight. She's one of my favorites as well. Downey's under contract for a 4th movie, so we knew that was coming. He's been saying that will be his last, though. There's been talk that the 5th will be War Machine. At this point, I don't think I want Sony and Marvel getting together on a Spider-Man project. It will mean -another- re-boot, and it doesn't need to go through that unless Marvel gets the property back. #7 Queensryche - a brilliant album for the gym! Congrats to Brinda, Terri, and Gwen! Cool photo. Love the mantis helping out. I hope that your latest novel is a done deal with your publisher soon, Alex! It was fun to see you on Goodreads. Wow! I don't do well with outlines, because I have to flounder around and find my direction and voice. It's always been that way for me. It's usually the setting that inspires me. I guess I've lived in areas where the location determines your life. And I use music to get at emotion. One day, sooner rather than later, I'm going to be on Goodreads (That's a goal, not a dream!). I'm watching Outlander, listening to Passenger, and rereading LOTR. Have you started your next book yet? I have doubts about Sony and Marvel getting together to make a sandwich, let alone a movie. It's a nice dream, though. I hope Spiderman gets crossed over. Yes! So glad there is an Iron Man 4. Saw Iron Man 3 in theaters and plan to see all others there first. Downey also did an interview this morning on ABC's morning show for The Judge. Sounds like a good movie but not sure I can fit on my movie list. My budget is tight and I saw only two movies last month and for this plan to see The Equalizer and Gone Girl. Hopefully The Book of Life around November. Must see for November (my birthday month) is Big Hero Six. Will be checking out that trailer Mr. Del Torro is so dark and talented. Go Mini Alex and it seems you've been Chris Brown'd. Was that mantis going for your guitar or a kiss? A Marvel adaptation of Spiderman...wow. Love how the praying mantis show up in the fall. I've seen so many. I set up the Q an A too and received those bland questions. Can't wait to hear this inspiring song. Love little Alex. He should make more appearances. Ehh... I'll believe Sony and Marvel working together when I see it. It seems like everyone's trying to imitate the Marvel movies' success these days, so I have serious doubts about any studio giving up money when superhero movies are involved. Hrm. Andrew, maybe they'll just dump him in with the others without a reboot. Fundy, next book? No pressure! Sheena-kay, no kiss! Mini-Alex like the ladies, not the bugs. Whattt....How can there be more Iron Man's after...the ending of the third one? Love the shot of Mini-Alex! 2 – guessing ... Misfits? Mini-Alex kind of scares me! Thanks, you did real good. And it was funny. But mostly it was great to read. That's interesting about the unofficial Dredd project. I suppose he can get away with it because it's free. Okay, I love peanut butter too. But on pancakes? I'm looking forward to your inspirational song reveal. May you have a wonderful done deal with your publisher soon! I'm really looking forward to Age of Ultron. And I know like three of those albums! Album no.4 is one of my favourites. Congratulations on submitting your MS! 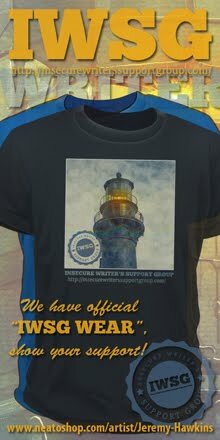 And a huge thanks to you and the team for all your work on the IWSG anthology! Yes, mini-Alex should grace your posts more often! And yay, I know some trivia. :) Alice in Chains for Jar of Flies, and Joe Satriani for Flying in a Blue Dream. Both were awesome albums! Lots of big movie news and love the photo of Little Alex and his friend. I love peanut butter and like to eat it with an apple. I can't get my favorite peanut butter-- Skippy extra crunchy-- in Panajachel. We can buy a Planter's brand but it's pretty expensive. Anyway, totally agree with you about peanut butter!!!! It's an essential food group. 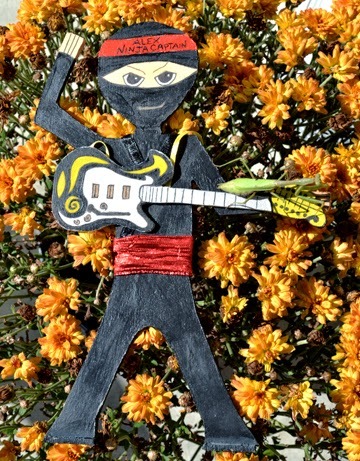 Absolutely -- love the stolen garden gnome pictures of Mini-Ninja-Alex! 8. I think Dream Theater? I think the mantis is trying to eat the guitar. You forgot to mention that RDJ said he wouldn't mind doing an episode of AGENTS OF SHIELD, too. Marvel plays hardball when it comes to money -- did you know that Scarlet Johannsen got paid more for AVENGERS than Chris Evans? I don't hold out much hope for the Sony/Marvel agreement. Marvel is canceling THE FANTASTIC FOUR as a comic to hurt Fox. And it has mandated that no new mutants are to be created in the X-comics so that Fox is not handed more characters to play with. Mini-Alex is all we get. More! More! (unless Maxi-Alex is going to show up once in a while.) Enjoy Anne R Allen's post yesterday. ZERO on the music challenge, but it's my Friday at work so I'm a bit disconnected. I thought my mom was the only one who ate peanut butter with her pancakes. I've tried it. Sometimes I do, and sometimes I don't. Now I know one other person who DOES. It makes my heart sing to see RDJr doing so well. There was a time during the 90s, when his drug problem raged, that I just wasn't sure he would ever beat it. I am so glad that he came out on top of that one. It would be awesome to see Spidey crossover! Pancakes and peanut butter . . . that is interesting. I'm not sure I'd try it though lol And yes to more Mini-Alex pics! I am always up for another Marvel movie. I can't wait! Off to check out the Dark Judges link. Thanks for sharing. My mate is very excited about your Dark Judges news! I think Mini-Alex should do some traveling. Like the Gnome in the Travelocity commercials, Mini-Alex could go all sorts of local places. Mini Alex should definitely make more appearances. Thanks for all the info. Have a great weekend! It is perfect in your book that tower of books! Songs really can be inspiring. Waiting to hear more about your latest. Love Mini Alex hanging out in the mums! Iron Man 4, I know some people who are going to be excited about that. (Me included) I didn't think there would be a forth. Love the fall ninja photo! Okay so the music trivia. I'm so ashamed! That's all I know! And yes, peanut butter is indeed awesome! Love mini Alex with the mantis! I posted a pic of a mantis on my face a couple of weeks ago.... lol! Mini Alex strikes a nice pose! Like the idea of a Spiderman, Marvel hero movie. I'd love a new Ironman movie, and "Face Off" is such a cool show! Congrats to Brinda, Terri and Gwen! Good luck with the GR Q&A. Yay for mums and miniAlex, but--erm--not for mantises. Eeeek! I love that picture of mini-Alex. What are the odds of a praying mantis just waiting there for you to snap his picture? Well, Alex, thanks to you, I'm addicted to FaceOff. I have one sitting on the DVR waiting for me to finish watching it. I'm amazed by these people and their talents! Congrats on the new releases, everyone! Chris, that made me laugh! And you got half right. Roland, that is so underhanded. Patricia, I can help with that. Robin, your mom is awesome. Fran, she's a fan then? Kelly, that's more than most! Elise, you're welcome! Such a great show. I'm now betting on the cake decorator to win. Haha! Yes, Mini-Alex should make more appearances! I thought I was up on modern music, but your trivia section did me in. I don't know any of them! I guess I'm ready for Pleasant Acres farm. I liked the Flash! Kept imagining you cheering him on. Congrats on all the new books. Oooh, those are nice flowers! Can't wait to hear what song inspired your book! I like Robert Downey Jr. okay, but I wonder if he said why they are going to do it. I'd love to see something original, every now and then. Did you know that Praying Mantis kill and eat humming birds? I didn't until recently, it's a pretty barbaric process. Ninja Alex should go to the Death Star next and I hope Downey keeps playing Stark since he's the soul of the Marvel Universe. Peanut butter is awesome? Okay, I'll take your word for it. I love peanut butter, but because most commercial peanut butter is loaded with sugar (on the average about 13g per serving), I use natural, which of course no self-respecting child would eat, 'cause it ain't loaded up with sugar. Kristin, I do both! Party on. Sorry, JJ! I tried not to pick anyone obscure. Joylene, he almost moves as fast as I do. Pat, wow, I had no idea. How do they catch them? Maurice, I'll see what I can do! GB, that's right. It's like breakfast cereal - no sugar, what's the point? Music Trivia is not my thing, but it'll be cool the seen the answers. Face-Off is my favorite reality show besides Amazing Race. We don't have cable, so I catch up on SyFy at the gym. Flying in a Blue Dream, Joe Satriani immense! Love the praying mantis shot! Milo, such a great show! Congratulations to all the book releases! I love mini Ninja Alex! Too much fun! Yay for being on a shelfie. I enjoyed Brinda's first book in that series. I love mums, although a ninja kind of stands out against them. I just saw Gone, Girl after having read the very excellent, superb thriller. All other movies pale before its magnificence at the moment. My type of movie. Great to see the blogger books keeping on coming! Movie trivia I can do, but not so much music trivia. I liked The Flash, too! I'm glad there was a short villain arc for that episode, and a hint at something bigger. That would be cool if Sony and Marvel teamed up.